June 2009 has come and gone and we are in the thick of summer out here. Hot sticky days are followed by thunderstorms and skin-drenching rain. My garden is in full bloom and my schedule has simply exploded. And June has been a special month for me as I have travelled a lot, and written a fair bit!! I have also been the host of one of the most delightful and creative events to grace the food-blogosphere - My Legume Love Affair. Created by Susan @ The Well-Seasoned Cook, the 12th helping of this event has been running from June 1-30, 2009 @ Annarasa ! Though the title of this post reads 'The Roundup', I'd like to share at the very outset that the response to the event has been super and it will take me more than this single post to get everyone's entry up. The prize winning entry will follow the completion of the entire roundup on this blog:) Let me begin with thanking everyone who has participated and sent in such delightful recipes, all of which I feel privileged to share with you via this roundup. I would also like to thank everyone for their patience and request that in the event that you do not see your entry in the completed roundup, just send me an email and I will make sure it is placed in its rightful spot. Do remember though that the recipe roundup reflects the entries date wise as they landed in my inbox. The very first entry I received for MLLA 12 has come from Sailaja @ Sailaja's Kitchen. Sailaja loves good food and she has prepared a deliciously spicy Rajma Vada. Doesn't it look like a tasteful and healthy snack! Lubna @ Yummy Food has been a delightfully busy cook this month. She has enthusiastically sent in several yummy recipes for MLLA 12 over the course of the last month! I will detail them as they came in. 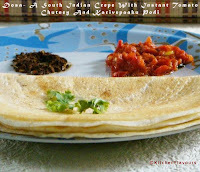 The very first from her is Dosa - A South Indian Crepe with Instant Tomato Chutney. Two entries from Priyasuresh @ Priya's East N Tasty Recipes are next. The first is Red Bell Pepper and Peanut Chutney - just look at the colour! And the second is a distinct and interesting preparation called Sri Lankan Paruppu Kari. Laura @ The Spiced Life loves her legumes. She sent in this beautiful Sabzi Dhan Shak (Parsi Spicy Squash & Legume Stew). 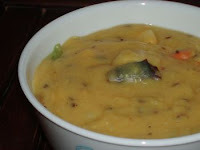 Laura writes "Dhan Shak is a A famous Bombay dish, made unique by its use of Parsi dhanajeera powder, this lentil, mung bean and split pea stew is thick with veggies and fragrant with spices". The second entry from Lubna @ Yummy Food arrived in my inbox a few days later. It is Idli - A South Indian Delight. 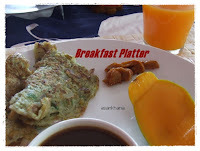 Do visit her blog for some interesting information on this all-time favourite dish from the Southerns states of India!! 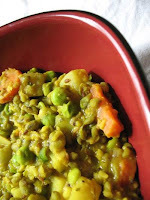 Lisa @ Lisa's Kitchen writes, "One of my favorite beans is the versatile oval-shaped whole green mung bean. Particularly easy to digest, especially when soaked overnight, cooked along with some spices and vegetables, this mildly sweet little legume can easily be transformed into an entree that will quell thoughts of a decadent dessert". Lisa sends in Mung Beans with Mixed Vegetables. Sra @ When My Soup Came Alive has recently acquired a new Bengali cookbook!! From this cookbook comes a recipe Legumes, And a Bit of Cheese - which is quite simply a mildly spiced but heavy dal. Sra says she tried this recipe "because the combination of paneer, potatoes and moong dal is intriguing and piqued my curiosity". Middle-Eastern cuisine has captured the hearts of Bird's Eye View and her family! Writing @ Food and Laughter Sra says she happily discovered delights of ME cooking when visiting friends in New york. Now ME fare is as much a part of her cooking as any other. Here she has prepared Hummus to share with us at MLLA 12. A tasty, healthy, and filling snack is coming our way courtesy of Aparna @ My Diverse Kitchen. 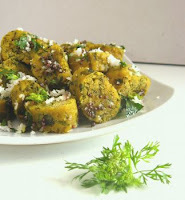 Aparna notes that a delicious combination of chickpea flour and fenugreek leaves is all it takes to prepare these yummy looking Methi Muthias - Steamed Fenugreek Leaves! Priyanka of Asankhana blog prepared a breakfast treat with a platter of Moong Dal Chila, and served it with tangy home-made mango pickle!! A perfect and satisfying breakfast. Join me at my next post for more from My Legume Love Affair: 12th Helping!! All content, text, and photographs in this blog, unless otherwise noted, are Copyright of © Annarasa 2007-2010. All Rights Reserved. Kindly do not reproduce without permission. Lovely roundup with yummy dishes! Waiting eagerly for more! Thanks so much for taking the helm for MLLA12! Good start, waiting for other entries! Thats a real yummy round up start! I am waiting for mine! !